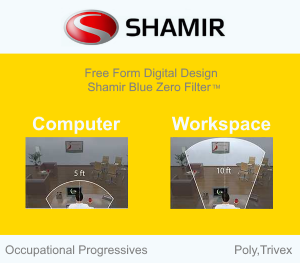 Shamir has designed two great lenses that address work and computer issues. These lenses are for people that need a wide field of vision at different distances. The lens materials, both polycarbonate and Trivex have Blue Zero. Blue Zero is a clear monomer that filters a degree of HEV blue light. Both lenses can be purchased on the same product page. Shamir Computer viewing area is designed for up close reading to 5 feet away. These progressive lenses provide a very wide viewing area. These work particularly well for desk, computer work, even with dual monitors. Shamir Workspace viewing area is designed for up close reading to 10 feet away. These progressive lenses provide a very wide viewing area for desk and computer work but also allow you to move around your office or similar environs. Here is a couple of videos. More information can be found at the Shamir website. Workspace 360 Video. Works with Google Chrome or Firefox browsers. Available in Polycarbonate and Trivex with Blue Zero filter. Order up to 2 frames for trial. Find a frame and click Add To Cart. Do not select any lens type or options. Order the lenses. Go to the lens product page, configure the lenses, click Add To Cart. Once your order is placed we will ship you the frames. Try them on and see if you like them. When you decide which frame you like, take a picture of yourself with them on. (We will send you instructions. It's easy.) E-mail us the image. When we get the image we will use our secure, proprietary software to obtain your PD and Fitting Height. Ship the frames back to us with the enclosed pre-paid return label. We process and ship the completed pair back to you. All shipping is free via Priority Mail. Total turn-around from order to getting your completed glasses is about 2 weeks. If you have any questions I would be happy to consult with you. Contact Us!